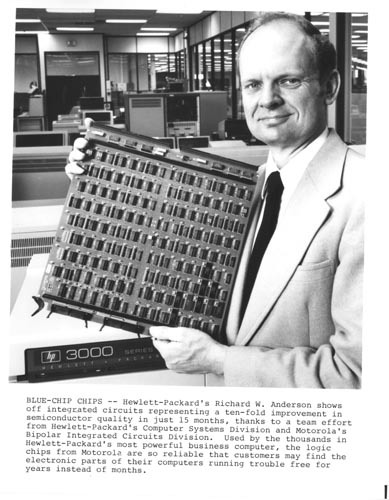 Black and white image of Richard W. Anderson holding an HP 3000 Series circuit board. In the background is an IT installation. Label at bottom " BLUE-CHIP CHIPS -- Hewlett-Packard's Richard W. Anderson shows off intgegrated circuits representing a ten-fold imporvement in semiconductor quality in just 15 months, thanks to a team effort from Hewlett-Packard's Computer Systems Division and Motorola's Bipolar Integrated Circuits Division. Used by the thousands in Hewlett-Packard's most powerful business computer, the lgic chips from motorola are so reliable that customes may find the electronics parts of their computers running trouble free for years instead of months."